Apparently committing in-game bank robberies with strangers and friends is the best way to develop a thriving gaming community. If you're up for a co-op crime spree, today's release Payday 2 might fit the bill - especially if you're looking for a helpful community to get you started on various heist missions. Although you can't grab a "five finger discount" there are still substantial savings to be had. The Steam-activated PC download version is priced at $29.99, but if you shop at the UK-based Green Man Gaming, there's a 20% off coupon code dropping the price to $24. The general consensus thus far from critics is positive, netting a strong 80/100 Metascore. The other big title launching today is the strategy conquest simulator Europa Universalis IV. Unlike Payday 2, you won't be able to use GMG's 20% off coupon here, but GameFly's PC download department has their own August-themed coupon, also worth 20% off on select titles. That'll drop EU4 down from $39.99 to $31.99 - a decent $8 savings off what everyone else is charging. Payday 2 (PC Download) - $24 at Green Man Gaming. List is $30. Deal expires August 16. Released today. Europa Universalis 4 (PC Download) - $31.99 at GameFly. List is $40. Released today. Duck Tales: Remastered (PC Download) - $12 at Green Man Gaming. List is $15. Deal expires August 16. Released today. Dishonored: The Brigmore Witches (PC Download) - $8 at Green Man Gaming. List is $10. Deal expires August 16. Released today. Mario & Luigi: Dream Team (Nintendo 3DS) - $34.99 at GameStop. Released last Sunday. List is $40. Deal expires today. 1C Company Titles - up to 73% off at GameFly. EA Weekday Sale - up to 68% off titles at Green Man Gaming. Cubetractor - $7.50 at Green Man Gaming. Releases August 14. List is $10. Deal expires August 16. Worms Clan Wars - $14.06 at Green Man Gaming. Releases August 15. Next best is $19 at Amazon. Deal expires August 16. Lost Planet 3 - $37.50 at Green Man Gaming. Releases August 26. List is $50. Deal expires August 16. FF XIV: A Realm Reborn Digital Collector's Edition - $37.50 at Green Man Gaming. Releases August 27. List is $50. Deal expires August 16. Standard is $22.50. Both comes with early access, pre-order goodies. CE gets more in-game goodies. The Sims 3 Movie Stuff - $15.99 at GameFly. Releases September 10. List is $20. What is this? The 50th add-on "Stuff" pack for The Sims 3? Batman Arkham Origins - $37.50 at Green Man Gaming. Releases October 25. Next best is $50 at GameFly. Deal expires August 16. Tomb Raider (Xbox 360, PS3) - $19.99 at Best Buy. Next best is $39 at Overstock.com. Deal expires August 17. XCOM Enemy Unknown (Xbox 360) - $19.99 at Microsoft. Next best is $37 at Rakuten. Crysis 3 - Pre-owned (Xbox 360, PS3) - $17.99 at GameFly. Next best is $29. Deal expires August 19. Darksiders 2 - Pre-owned (Wii U, Xbox 360) - $14.99 at GameFly. Next best is $39 at Amazon. Deal expires August 19. Dishonored - Pre-owned (Xbox 360, PS3) - $12.99 at GameFly. Next best is $30 at NewEgg. Deal expires August 19. The Walking Dead - Pre-owned (Xbox 360) - $12.99 at GameFly. Next best is $30. Deal expires August 19. Max Payne 3 (Xbox 360) - $9.99 at Microsoft. Hitman: Absolution - Pre-owned (Xbox 360) - $9.99 at GameFly. Next best is $18 at Amazon. Deal expires August 19. Resident Evil 6 - Pre-owned (Xbox 360, PS3) - $9.99 at GameFly. Next best is $17. Deal expires August 19. Aliens: Colonial Marines - Pre-owned (Xbox 360, PS3) - $8.99 at GameFly. Next best is $22. Deal expires August 19. Sid Meier's Civilization V: Brave New World - $22.99 at Green Man Gaming. Next best is $30 at GameFly. Immortal Action Pack - $21.99 at Amazon. Next best is $66. Deal expires August 14. Includes 4 titles: Batman Arkham City GoTY, Lord of the Rings: War in the North, Mortal Kombat Arcade Kollection, and Mortal Kombat Komplete Edition. Mortal Kombat Komplete Edition - $13.49 at Amazon. Next best is $30 at Green Man Gaming. Deal expires August 14. Beatbuddy: Tale of the Guardians - $10.80 at Green Man Gaming. Released August 6. List is $15. Deal expires August 16. PS3 500GB Assassin's Creed III Bundle - $229.99 at eBay. Next best is $300 at Best Buy. Deal expires August 17. PS3 250GB Move Bundle with 4 games - $229.99 at eBay. List is $350. Deal expires August 17. Included game titles: Sports Champion, Eye Pet, Start the Party, and TV Superstars. Sapphire Radeon HD 7970 3GB GDDR5 PCIe HDCP Video Card - $289.99 at NewEgg. List is $400. Deal expires August 19. Model #100351SR. Asus GeForce GTX 660 2GB GDDR5 PCIe Video Card - $198.69 at NewEgg. Next best is $243 at Amazon. Deal expires August 14. Model #TI-DC2O-2GD5. Bonus FREE Tom Clancy's Splinter Cell Blacklist game. 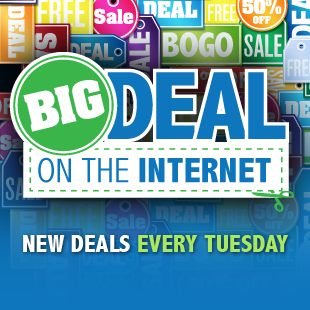 The Weekly Big Deals on the Internet is brought to you by the crew from Dealzon. If you want to save money on game deals, check in every Tuesday at 5:30PM Eastern for the latest deals.